CLEARWATER, Fla. – The line drive off the fungo of minor league outfield instructor Andy Abad came in about seven feet high, and was just about to crash off the center field wall, when Odubel Herrera made a running stab, attempting to corral it. Instead, the ball bounced off the wall and out of Herrera’s immediate reach. The Phillies’ best player slammed his glove into the wall’s padding. The daily work for Samuel, Abad, and Herrera begins at 8:30 a.m. each morning in Clearwater, more than an hour before the team takes the field for workouts each day. It’s a routine that began two years ago when Herrera arrived on the roster as mostly-unknown Rule 5 pick who was attempting to make the transition from Texas Rangers infield prospect to Philadelphia Phillies starting outfielder. The work saw significant progress this offseason when Herrera was named one of three finalists for the Rawlings Gold Glove Award for National League center fielders. “It should mean a lot and it should be an incentive for him, to have that as a goal and see if he can get one at some point,” Samuel said. “I’m getting ready to win one,” Herrera said with his trademark grin through Phillies interpreter Diego Ettedgui later on Monday afternoon. 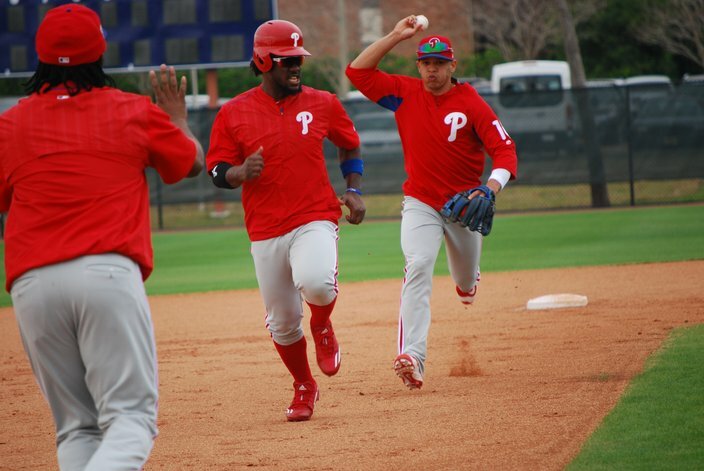 Of the 74 players in camp with the Phillies this spring, Herrera is probably the least of anyone’s concern. The front office obviously liked the 25-year-old enough to reward him with a five-year, $30.5 million contract before he was even eligible for arbitration. Manager Pete Mackanin can feel comfortable penciling Herrera’s name into the third spot in his batting order six weeks before Opening Day after watching him hit .291 with a .353 OBP in the last two seasons. But the truly great players in any sport are the ones willing to work to get better after they’ve already established themselves as All-Stars, as Herrera did in his second big league season last summer. They’re the ones who make everyone around them better, too. It’s too early to crown Herrera that caliber player and person, but he's making an impression a week into Camp Clearwater. Mackanin believes Herrera has the talent to win a batting title (and it should be noted Herrera did just that in the Double-A Texas League and the Venezuelan Winter League in 2014-15). If Herrera can take the first 85 games of the 2016 season, when he showed off more disciple at the plate and slashed .305/.390/.444 with 10 home runs, and replicate it over a full season, he could be more than a batting title contender. But offense has always come naturally for Herrera, a .294 hitter in six minor league seasons with the Rangers. It was his lack of a strong defensive position – and a glutton of Rangers prospects – that led to him being unprotected in the Rule 5 Draft. So Herrera is working to make himself a complete player, as strong on defense as he is on offense. That’s why he’s jumping at outfield walls early in the morning in Clearwater. Herrera has often been able to make up for a lack of raw outfield instincts with athleticism. Like on that memorable July afternoon at Wrigley Field two years ago. During the first season as the Phillies everyday center fielder, taking the regular job away from Ben Revere, Herrera made two no-hitter saving catches for Cole Hamels, the last a circus grab, dubbed "the Immaculate Overran Catch" by Jimmy Rollins last summer, to preserve Hamels’ memorable final start in a Phillies uniform. Herrera may have initially overrun the ball, but he’ll never escape that play: someone brought it to his attention before this reporter did on Monday, in fact. Although he was charged with nine errors last season, tied with Ian Desmond for the most among center fielders, Herrera also showed plenty of progress as an outfielder, too. He graded out well in advanced stats, with six defensive runs saved (tied with Mike Trout, only six center fielders had more) and only four major league center fielders (Kevin Pillar, Billy Hamilton, Ender Inciarte, and Jackie Bradley Jr.) had a better Defensive Runs Above Average than Herrera’s 6.1 in 2016. Herrera called it “very special” to be named a finalist for the Gold Glove Award. He lost out to Atlanta Braves center fielder and fellow former Phillies Rule 5 pick Ender Inciarte, who he worked out with this winter and who he’ll also play alongside in the Venezuelan outfield in next month’s World Baseball Classic. Herrera has played in an All-Star Game. He has a handsome contract. He has been recognized for his improving defense, too. But he’s far from a finished product. Samuel wants his center fielder to stay in tuned to the game better in the outfield. He wants Herrera more comfortable at the center field wall. He needs him to keep working every morning each spring. Herrera may still be a work in progress, but that’s probably a good thing for a player hoping to lead the next contending Phillies team.